The synonym of Dwingeloo is nature. Nowhere in the Netherlands you will find so many acres of nature. You will find no less than two national parks within 1000 metres of our location, namely the National Park Dwingelderveld and the Drents Frisian Forest. In the Dwingelderveld you will find the Holtingerveld, the largest wet heathland in Europe, with the increasingly rare juniper bushes. The area offers unique flora and fauna, two photogenic sheep herds and a large visitors centre. Our guests practice cycling, hiking, mountain biking and jogging directly from the hotel on numerous paved and unpaved trails in the surrounding nature. 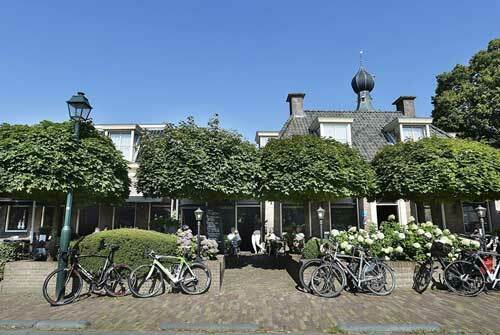 The hotel offers bicycle storage, charging and next to the hotel you will find a bike rental shop. Dwingeloo is located in Southwest Drenthe and is part of the municipality of Westerveld. Together with Dieverbrug, Eemster, Leggeloo, Lhee, Lheebroek and Stro Vledder, Dwingeloo has about 4150 inhabitants. During the tourist season, both summer and winter, there is plenty of room to welcome guests in our beautiful village. A beautiful setting, a thriving social life, both on sporting and social level, enterprising people: the ingredients for enjoyable living, visiting or staying. When you are visiting Dwingeloo you might be curious about other nearby activities. Don’t forget to include a visit to the following places: the picturesque Giethoorn (Dutch Venice), the city of Groningen with its famous Groninger Museum, Assen with its TT Circuit, the Drenthe Museum, Westerbork where you will find the Memorial Center, Emmen with its unique zoo and Coevorden with children's park Plopsaland. More details of the current business agenda Drenthe, please refer to the website. Drenthe is the bicycle province of the Netherlands. Dwingeloo: this village is in a beautiful, prominent spot between two large national parks and there are dozens of bike trails. It offers a perfect starting point for cycling activities. We have more than enough space for bicycle parking and there is a bike rental shop. We gladly invite you to discover nature by bike. In addition to the hiking and biking trails Drenthe features a cycling system that allows you to plan your own route. Please ask for more information at the reception. Dwingeloo is the ideal location for you. This village is situated beautifully between two national parks where the wooded area provides a challenge for all mountain bikers. Racing cyclists will enjoy the greenery. Our hotel is the ideal starting point for all your sportive cycling activities. We offer bicycle storage room and a bicycle rental shop around the corner. We also have a Garmin account that you can use for beautiful trails near the hotel. Ask at reception for the credentials.